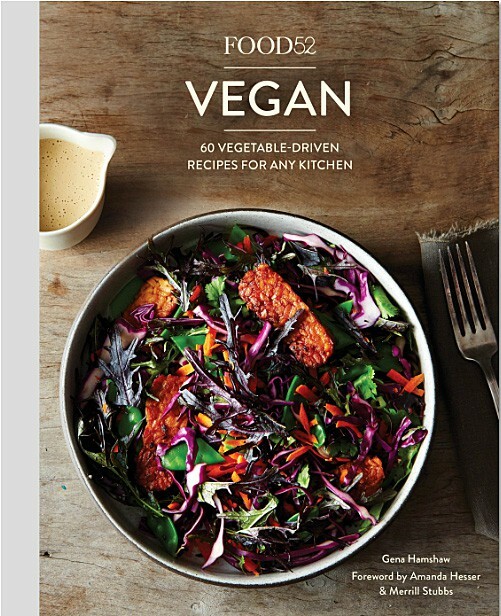 Today I’ll be reviewing the newly released book FOOD52 VEGAN – 60 Vegetable-Driven Recipes For Any Kitchen. I was really looking forward to this book because let’s be honest, there aren’t a lot of cookbooks that cater to us vegans in particular. The book has simple recipes for the everyday cook. Beginner to advanced, there is something for you in this book. It features 145 pages with beautiful photography and easy to follow recipes. The binding is also really nice on this particular copy as most hard cover books do not have the ability to lay flat. How nice that this one does! The book is broken into Breakfast, Appetizers & Snacks, Soups, Salads, Main Dishes and Desserts. In the back of the book, you’ll find information and recipes on basic substitutions such as egg replacers and making your own oat and nut milks. You’ll also learn how to make the cashew cream that we used in our adaptation of the books Gingered Carrot Bisque. Some highlights of this book include: Lentil Sloppy Joes, Butternut Squash Mac and Cheese, Double Chocolate Brownies and of course, the Gingered Carrot Bisque that we tried. Just delicious. I think you’ll really get a lot out of this collection. The Chocolate Cake with Chocolate Filling and Chocolate Ganache looks absolutely mouthwatering! If you already own this book, which is your favorite recipe? Let me know in the comment section below.